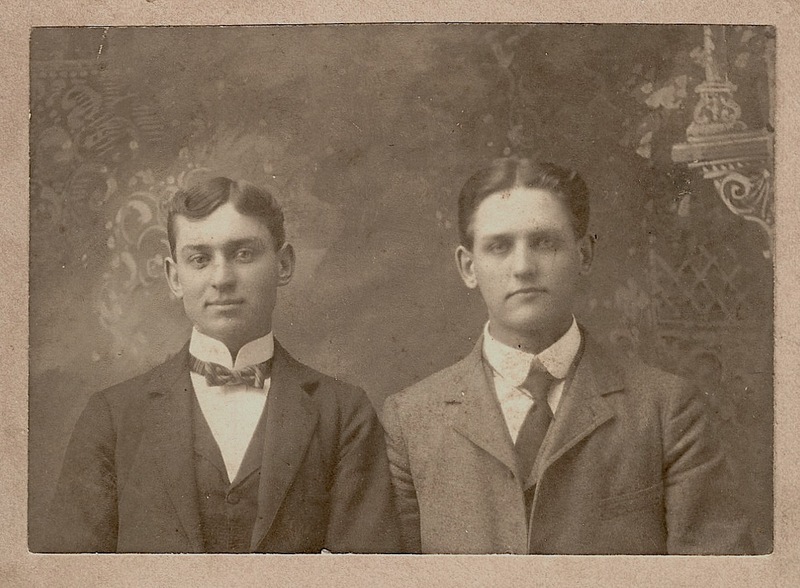 Today I'm highlighting a photograph of Howard Fasnacht and Erwin Frantz (based on the names written on the back). This photo was in the collection of my great-grandmother Jessie Burrows and was I believe a picture of two of her friends from back in Kansas. Neither of these two men were originally from Kansas, but their families must have somehow wound up there and I would guess that these two were in Jessie's circle of friends from college. Fasnacht is a name I recognize as my grandmother's cousin latter married Howard's son, Kenneth Fasnacht. I don't know what ever became of Erwin Frantz. One old family story I always found interesting was that Jessie's father, Charles Burrows, was the Chief of Police in Wichita. One day, there was a baby girl left at the railway station with no identification other than a handkerchief embroidered with the letter H tucked next to the baby. After the parents could not be located, Charles Burrows took her home and one of Jessie's married sisters, Maud Roton, took her home to care for the baby. Although newspaper ads were run and messages were sent to towns along the rail line, the parents were never located, so after several months, Maud decided to adopt the girl and give her the name Helen because of the handkerchief. Helen would eventually be the one who married Kenneth Fasnacht, the son of the man in the photo. I've always been curious about this story. Anyway, as I have no connection to this photograph, if there are any descendants of either of these two men who would like the image, just send me an e-mail and I'll mail it to you. What an interesting story. Sad, too, as Helen could never trace her ancestors.